Nickname: "Tintin" | "Floquet de Neu"
Koeman was the offensive central defender, Cruyff needed in his now legendary team. Ronald didn´t have pace, but instead possesed great technique, thus being a very important part of the build up play of Barcelona in those so wonderful years. When the team played good, there was no need of defenders in the traditional sence, because the ball was in the opposition´s half almost through out the whole game. And Ronald made his contribution to the teams offence. When the team didnt play optimally, Koeman´s lack of pace was terrible, and he was often forced to commit stupid fouls that often cost him yellow and red cards. He had a wonderful free kick, maybe the best at that time, scoring many goals for Barcelona. 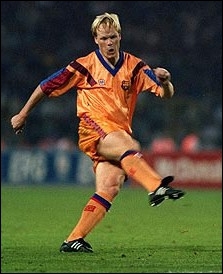 Ronald Koeman was perhaps best known for his powerful shot - one which, on more than one occasion, made the difference between triumph and defeat. One such occasion was May 20, 1992, the venue Wembley. Barcelona and Sampdoria were in the process of battling for the first Champions League title, with the match going into extra time. Eight minutes from the end, the Spanish side were awarded a free kick over 30 metres out. Up stepped Koeman to unleash a screaming shot just inside the keeper's post, handing Barcelona their first title in Europe's biggest competition. His legendary shooting, physical strength and ability to convert free kicks remain the most memorable aspects of his repertoire. Johan Cruyff took him to Barcelona, where he proceeded to fill his trophy cabinet with four league titles and the European Super Cup as well as the famous Champions League victory. Despite the successful period he spent with Cruyff at Barca, however, Koeman's golden year remains 1988. That year he completed the Treble with PSV winning the domestic championship and Cup, as well as the European Cup. During the 1987-88 season he hit the net a total of 21 times for PSV Eindhoven. He ended that season as the Dutch league's third-top scorer, not a bad accolade for a defender. Success flowed through the family, and gave football's statisticians cause for flurry when his brother Erwin added his own honours in the shape of the Cup Winners' Cup with Belgian club Mechelen. The Koeman brothers did not stop there, however. After succeeding at club level, they joined forces to help bring the European Championship to Holland culminating with a 2-0 win over the USSR in Munich, the highlight of which was a spectacular strike by Marco van Basten. With 78 caps and 15 major titles, Ronald Koeman put an end to his career, much to the delight of some of the world's goalkeeper's, always wary of the certain goalscoring opportunity a free kick would afford to the blond-haired cannon. After working as assistant coach to Guus Hiddink for Holland at the 1998 World Cup where they reached the semi-finals, he went on to fill a similar role at Barcelona. That was followed by a brief spell as coach of Vitesse Arnhem before he took over as coach of Ajax Amsterdam, whom he led to the Dutch championship and Cup in 2002. He then coached Benfica and PSV and coached Valencia with fellow legend Bakero as his assistant to a Copa del Rey cup being being let go for the poor league showing of Valencia.